Ultra-low cut, rendering them unseen in virtually any shoes, even the slightest of court or ballerina shoes, these Falke Invisible Step Cotton Shoe Liners are just the thing for warm summer feet offering a skin kind, light and comfortable barrier between you and those sticky, sweaty trainers. 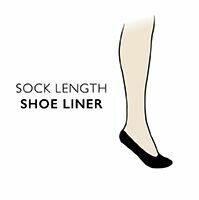 The socks are finished without hems to the sides and front, and with hand linked toes for smooth seams and for a flatter, smoother fit. Made with an anatomically shaped heel, and allied to an elasticated rib around the mid foot, plus Falke’s diamond pattern silicone anti-slip system, these Falke Invisible Step Cotton Shoe Liners will hold without that annoying sliding and riding under. For even better hold, try not to moisturise your feet before wearing Falke Invisible Step Cotton Shoe Liners.